I wrote a post a few months back about SheaMoisture's launch in Boots and the fact that there was this huge hype, even though SheaMoisture has been available to purchase in the UK for a few years. I also wrote about the product placement in the store and that it was a bit confusing to me as to why it was placed in the general hair section and not the ethnic section. In the UK it is very rare to find beauty products for black people in the general sections and I was slightly annoyed that SheaMoisture wasn't placed there, as I believed that as the UK hair market has recently started catering more to "mixed raced hair" that the placement in Boots catered to the white mothers of mixed children before us! 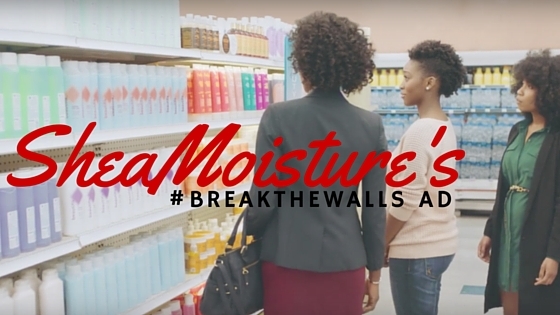 After watching the new ad, it makes more sense as to why SheaMoisture is placed in the general hair section....and I never really thought about the separation in stores when it comes to hair products, if anything it made it easier for me to purchase items because I know exactly where to go. But....the real question is. Why is there a separation? If hair is hair and all made from the same entity, why is there a separate section? Is it marketing collecting coins? Is it for accessability ? Or is it because black hair is not seen as being as good as european hair? As someone who promotes the beauty of natural afro hair and sharing the message of embracing your natural beauty, our beauty products should be side by side to everyone else's. Our beauty matters in a world that constantly tries to erase and steal from it. One thing I love about SheaMoisture from using the brand over the years and having them sponsor a few of my past events, is that they project the message of beauty being equal. That is the message a lot of brands claim to promote and stand by, but few actually act on it.